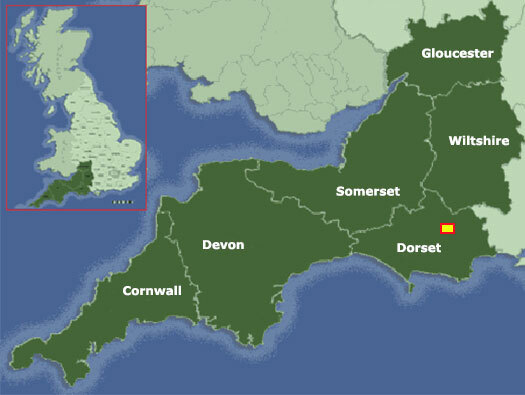 Situated to the east of Blandford Forum, Dorset, set on the top of a hill with expansive views across Blandford Camp and Badbury Rings (Iron Age hill fort). Blandford Army Camp had two US general hospitals to cater for casualties in France and also was a staging post for US troops going to France. Badbury Rings held the main beacon that the Americans used on D-day to navigate their Dakotas towards France. 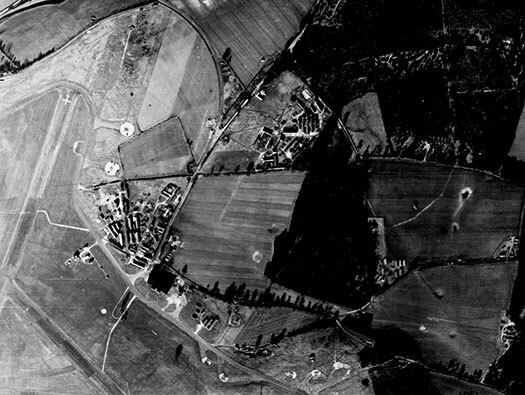 RAF Tarrant Rushton was the airfield that the gliders flew from for the attack on Pegasus Bridge. 196Sqdn Stirling III/IV,arrived 7 January 1944 and left on the 14 March 1944. 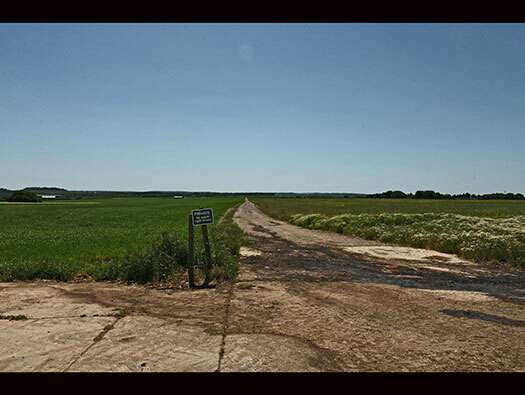 Then 298 Sq,Halifax V/III/A.VII,formed here 4 November 1943 and left 5 July 1945. 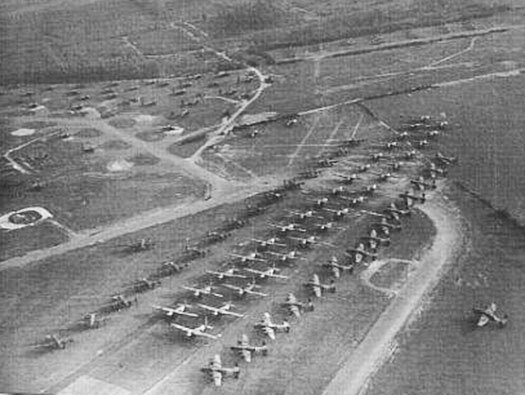 Airborne Forces of 38 Wing used Hamilcar,Hadrian and Horsa Gliders here to operations in Normandy, Holland and Germany. 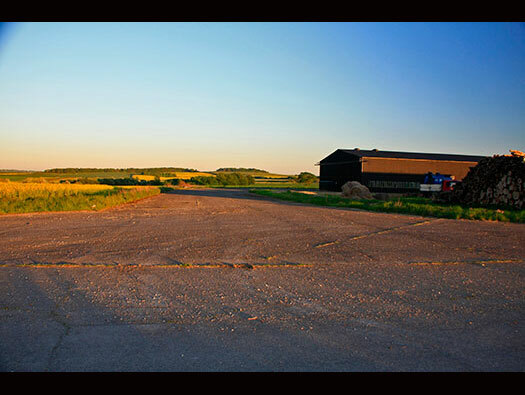 The RAF's Airborne Forces Tactical Development Unit was formed at Tarrant Rushton in 1943. It was responsible for investigating the tactical air problems in airborne warfare, and provided with a provisional staff establishment of 10 officers, 94 other ranks, four WAAF. On a very sunny day. 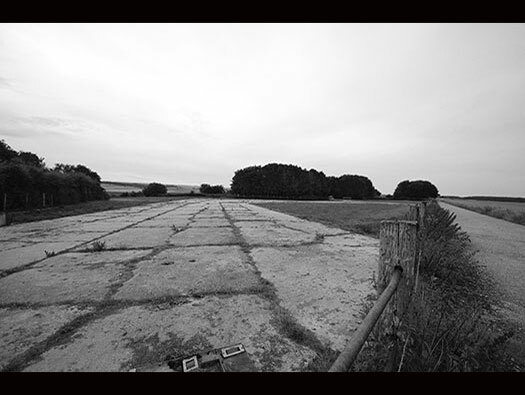 RAF Tarrant Rushton construction started in September 1942 by George Wimpy to an 'A' class bomber airfield. Designed for five T2 hangars, only four were built and two remain. With 48 looped (spectacle) and two frying pan dispersals. 1024 men and 135 WAAF's were the complement but I am sure this number fluctuated. 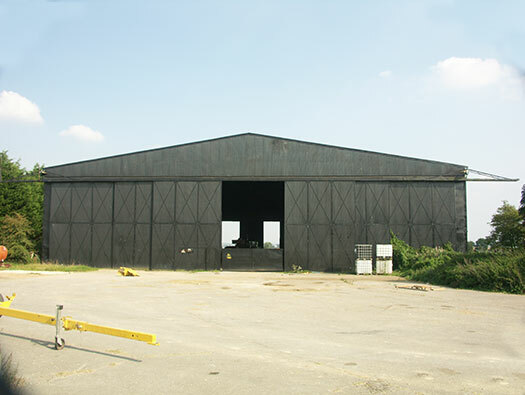 61 - Aircraft Shed T2 #2 3653-65/42. The uprights are double iron angles bolted together doubling their strength. US engineers assembling the doors at an airfield in the east of England. overed in sheets of corrugated iron. Plan of the Airfield site. 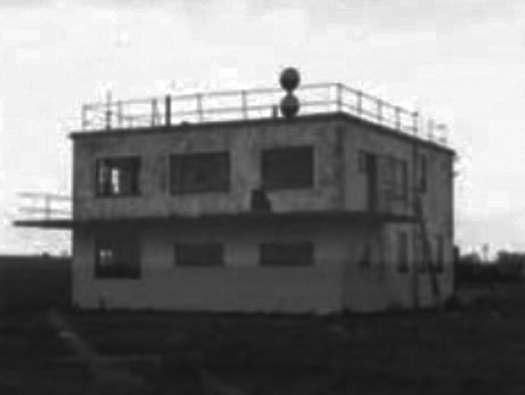 All the usual RAF buildings with operations block, picket post, crew briefing room, speech broadcast, parachute store, MT, main store & workshops, A.M.L teacher, Link trainer and by the control tower the fire tender house, floodlight trailer shed, pyro stores, compass platform, etc. 56 - Floodlight trailer shed(TB). 53 - Night flying equipment store (TB). 7 - Picket Post(TB) 12404/41. 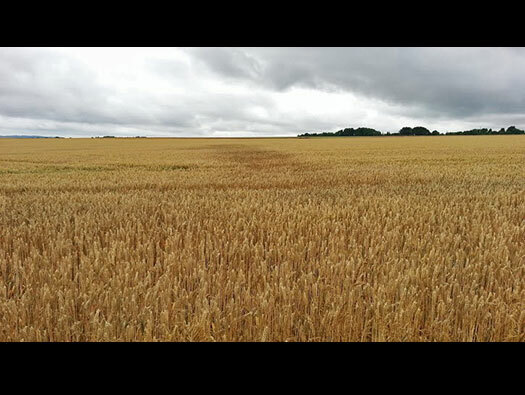 Called track because they started out as cinder tracks but by 1942 they had to be 50ft wide to take heavy bombers. Just giving an idea of a Lancaster with a wingspan of about 93ft and the perimeter track of 50ft. 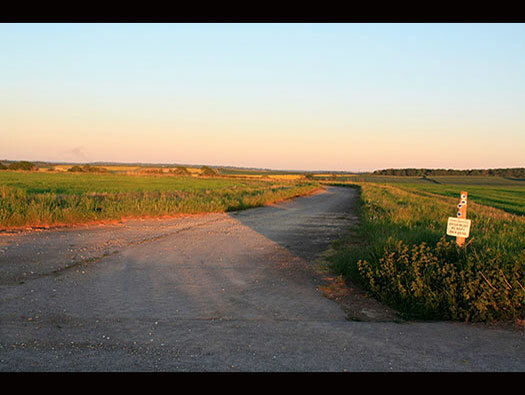 Roadway to where the control tower once stood. 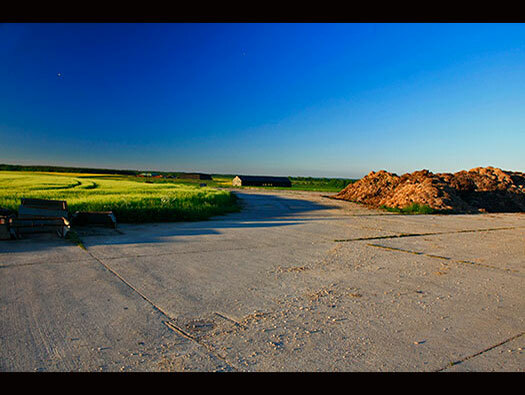 Just a sort of oily stain on the corn is left, this is where the road led out to the control tower and its ancillary buildings. 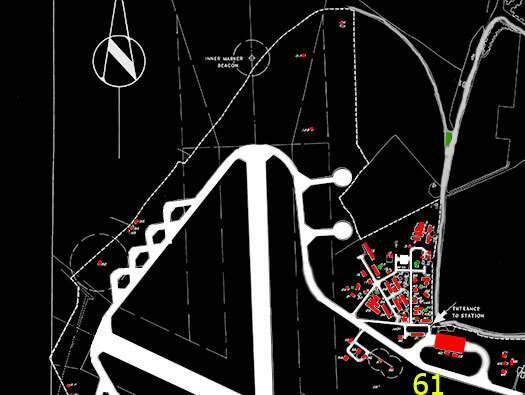 Plan of the Control Tower area with R to L.
53 - Night Flying Store(n) 12411/41..
54 - Watch Office (T.B.) 12779/41. 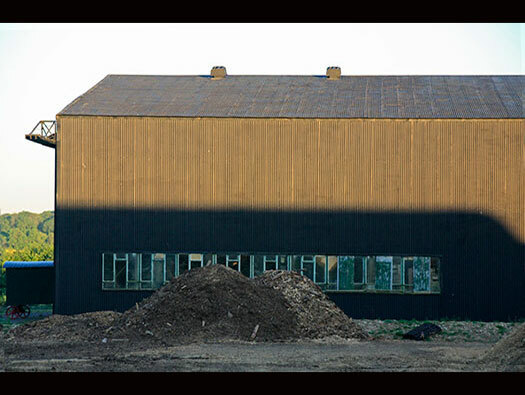 55 - Fire Tender Shed(T.B.) 12410/41. 56 - Floodlight & Trailer Shed(N) 12411/41. 59 - Sleeve Streamer Mast. 54 - Watch Office (T.B.) 12779/41, 343/43. It has one oddity that the left lower window is a large one? One of two that were here. B-3 Standard Class 'A' 150ft dia. "Pan" design. A large parking area with at least four tie downs to hold the aircraft in a wind. 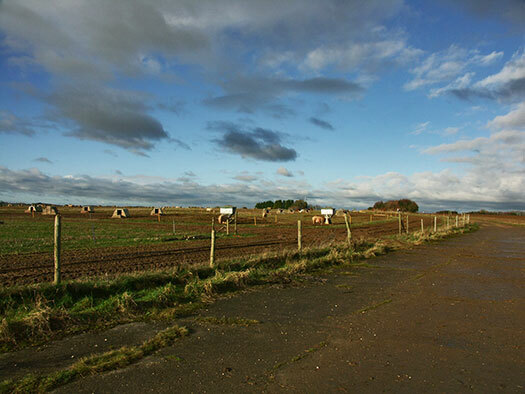 A post war photo of the airfield. The two frying pan dispersals show up well and the many dispersed Nissen huts littering the woods and fields. We are still on the perimeter track where it meets the main runway. This is where it turns to meet the main runway. The concrete here is of a later date and part of the cold war history of TR. I will write about this in a separate page. The main runway leaving to the left and contact lighting for the V bombers to follow. Perimeter track lighting showing what they should look like. AIX. Elkington Gatic man hole cover for landing lights. The main N/S runway 150ft wide, 6,000 ft long looking south. Armstrong Whitworth Albermarle a very under used aircraft as it did not come up to standard because of a bad design so they were sidelined as a glider tug. Stirling's were used here to supplying weapons to resistance groups, glider tugs and also on many bombing runs to especially V weapons in Noball Targets. (Noball was the code word for V weapon sites). A Hamilcar tacking off on Runway 19. 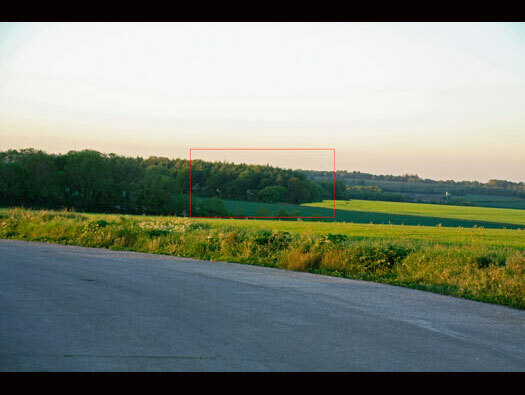 Note the yellow circle, it is a defence site with what looks like a Bofors gun and the red circle the tented area of the gunners camp. Hamilcar could carry a seven ton Light Tank Tetrarch. There were four Loop aircraft dispersals by the trees and only two remain..
Halifax and a Horsa glider about to rotate off the end of the runway. There were 48 on the airfield and these are the only two left. Called Loop or B-5 Standard Class 'A' "Loop" design. 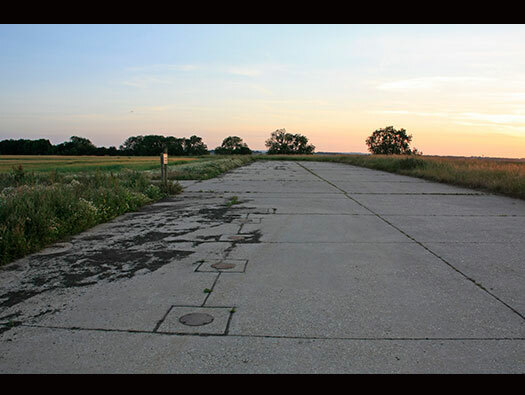 Perimeter track joining runway 13. 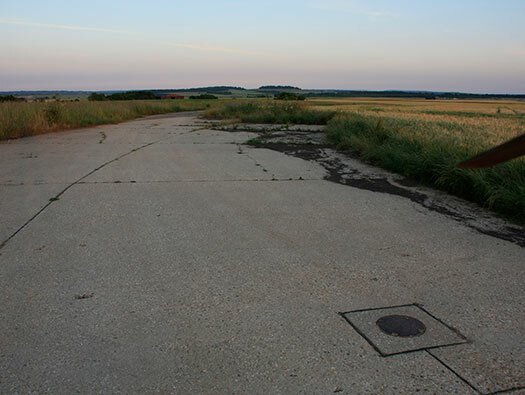 This area is where Hangar T2 '#1'. 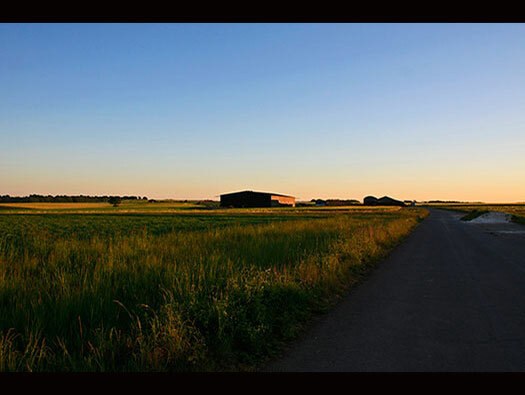 All that is left are the marks in the ploughed soil. 120 - Machine Gun & Cannon Range(TB) 147/41. 121 - Maintenance & Battery Charging(N) 829/43. 122 - Tech. Latrine(TB) 9026/41. 123 - Mnts. Unit Staff Block(N). 124 - Mnts. Unit & Oil Bowser(N) 12772/42. 127 - Aircraft Shed T2 3653 65/42. 128 - Acrft. Arm. Eqmt. Store(N). 129 - General Purpose Hut(N). 130 - Flame Float Store(N) [Type D] 12725/41. TB = Temporary brick or half brick. 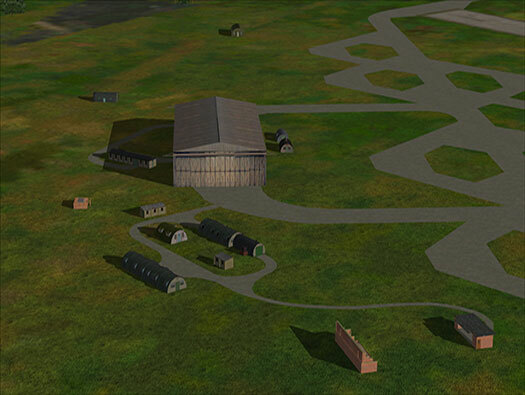 Flight Sim design of the area with grateful thanks to'Terry Wallis flight sim.' for the picture. This gives a good idea of how it may have looked. 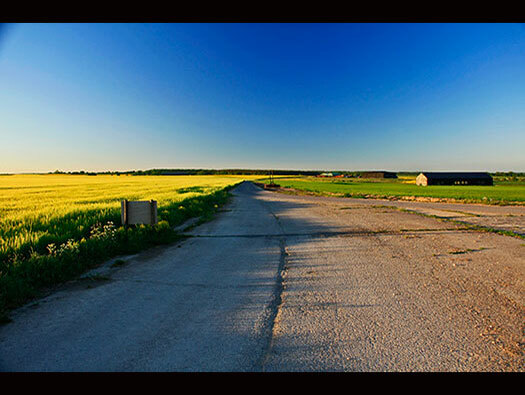 At the bend in the distance is the threshold of runway 08.Runway. 08 4,200ft long x 150ft wide. Coming around to the threshold runway 01. 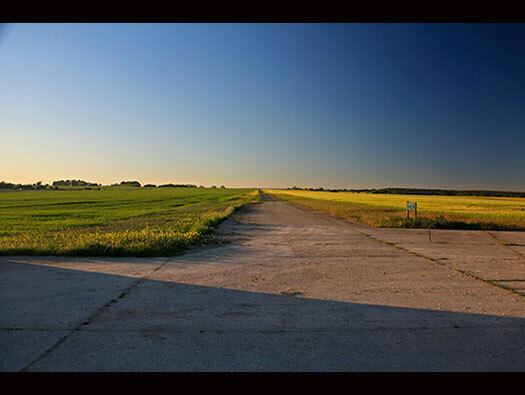 Runways were numbered by the RAF as 1,2 & 3 etc., when the Americans came into the war they used the compass layout and 01 degrees and 19 the same runway but the either end. This is the area where gliders and tugs were assembled in four rows ready for takeofs for all their attacks on the continent. Sterlings lined up prior to D-day. The Sterlings left for RAF Keevil to take up there jobs for D-day and Halifax's arrived and were then used here for D-day. The line up from above. Gliders parked behind the runway. The Sterling squadron 196 left in March to their D-day base of RAF Keevil, Wiltshire. 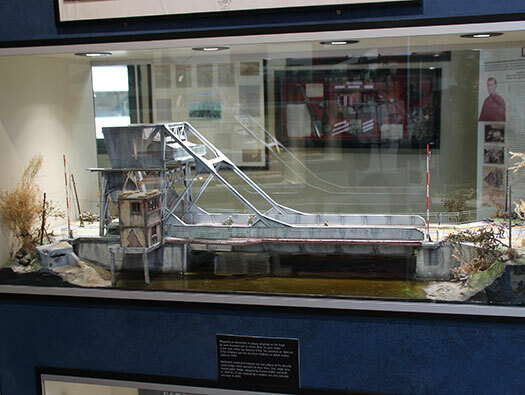 One of the D-day lifts. 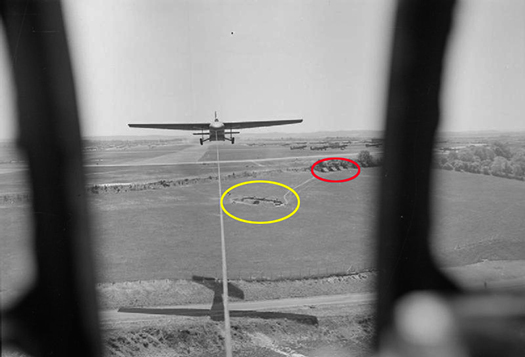 Three Albemarle's with Horsa gliders took off for the Merville battery. Six Halifax's with Horsa gliders then took off for the bridges over the River Orne. 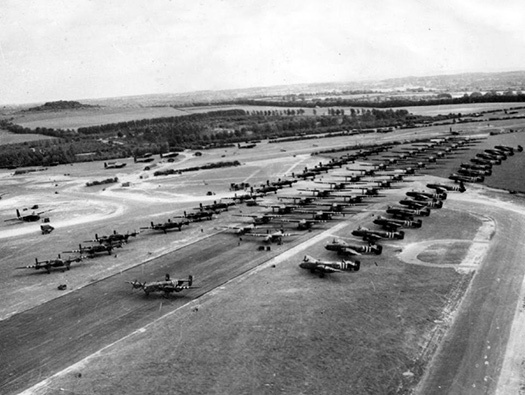 30 Halifax's with Horsa & Hamilcar gliders. 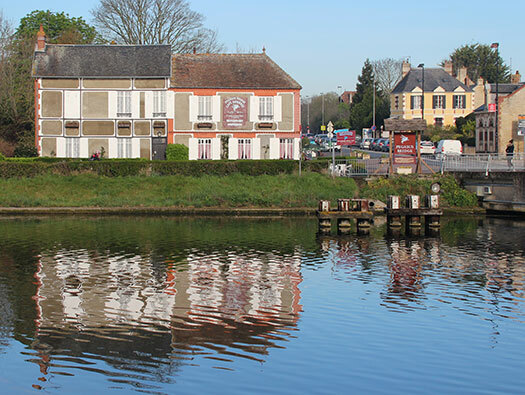 Pegasus bridge with the three Horse's top left side. 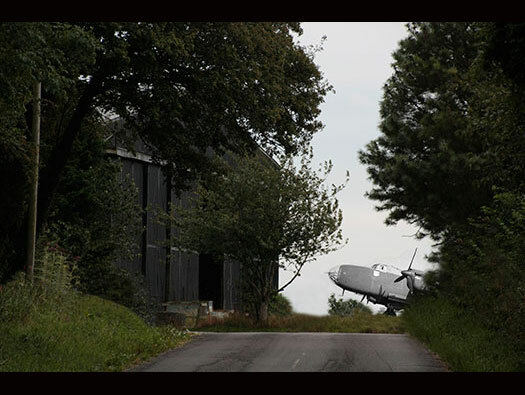 In the early hours of the 6th June three of the Horsa gliders landed at bridges over the Orne Canal. Troops arriving from the beach. Gliders all landed close to the bridge. The first house to be liberated in France. The first house to be liberated in France inside. V bomber track to their QRA (Quick Reaction Alert). 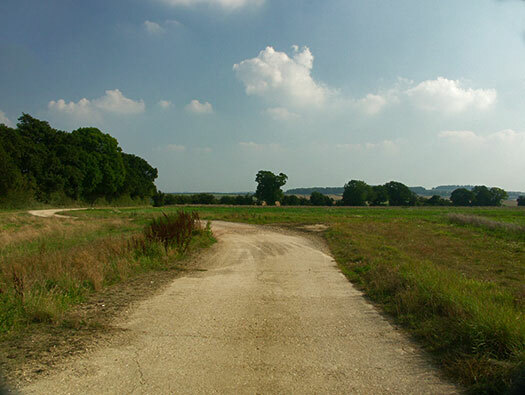 Four Valiant bombers on several occasions came down here and the crews were located on the A354 above Coombe Bissett. This was a wartime US hospital (now a corn store and play area). Most or all has now been removed. In the event of a nuclear war in the early 60's these aircraft would have flown to bomb Russia whilst we sat as children with our heads under our school desks. Four Valiant line up at a QRA. 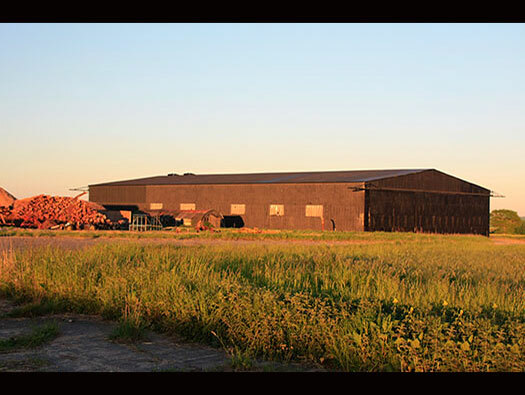 Marston Shed for servicing equipment for the QRA. 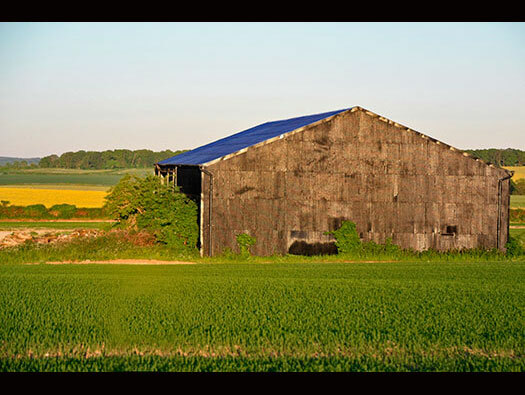 The Marston Shed was a wartime corrugated iron shed that could be assembled, easily dissembled and transported. 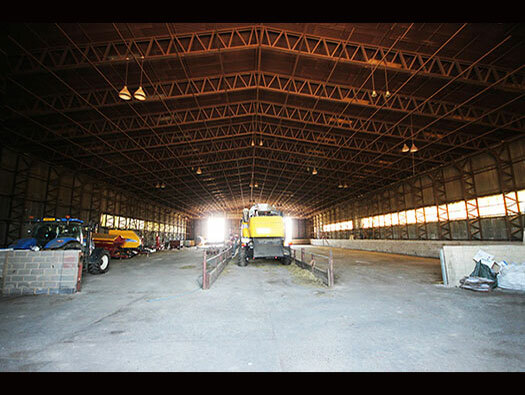 Marston Shed for servicing equipment of the QRA. Still a good sturdy building. 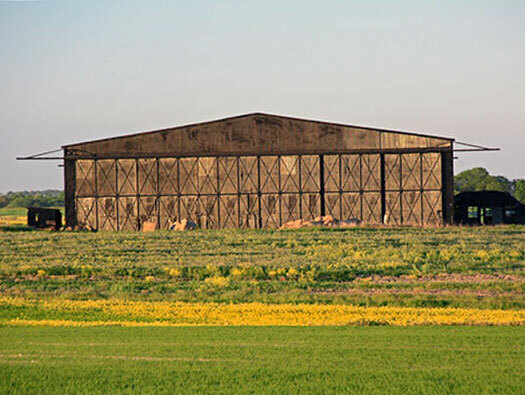 One of the best T2 hangars to photograph as it sits out on its own although today there are piles of wood around it as its a wood processing plant. The right hand 24ft Nissen hut. A very early digital photo from 1999, my goodness thats old. This end of the hangar was used by Flight Refuelling to paint Sea Vixens as targets. That is why there are vents on the roof. Mike Lees photo of a Sea Vixen. Sir Alan Cobham the founder of FR and Cobham PLC. The run in to the hangar. 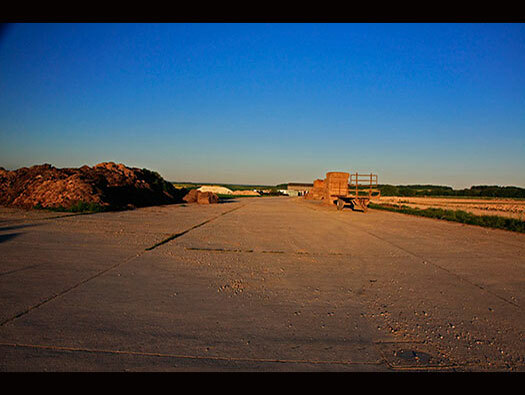 Loop dispersals and the site of T2 #3 now removed and the site of a hangar that was not built. T2 not built yellow. .
Perimeter track marking still showing up directing planes into the hangar. T2 #3 now removed (Mike Lees). View across to the Sick Quarters site a small gaggle of 24ft & 16ft Nissen huts arranged to hold sick from the nearly three thousand men & women stationed here and war casualties from returning bombers or training accidents. 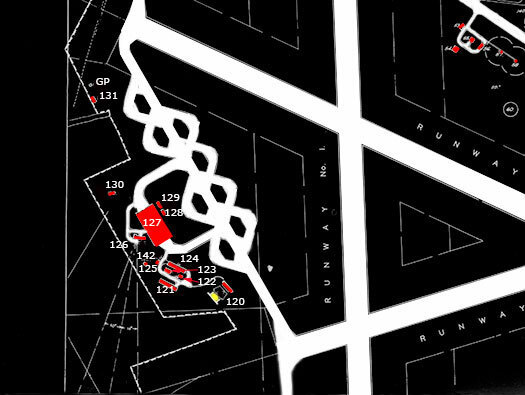 A plan of dispersed accommodation WAAF sites 3 &4.